At the end of January 2011, the Wall Street Journal announced the agreement to merge two of America's largest warehouse owners, namely ProLogis and AMB. This created the world's largest warehouse owner with total warehouse space exceeding 600 million square feet. This is a critical event for U.S energy policy since rooftop solar P.V. prices have plunged and large flat-roof warehouses are the best platforms for solar P.V. electricity generation. Both ProLogis and AMB have a major presence in the European warehouse market, including Germany and the Netherlands, where rooftop solar P.V. has a much wider market penetration than it does in the U.S. Many warehouse owners, particularly Wal-Mart supplies and other large consumer goods suppliers, must upgrade to solar P.V. supported warehouses in order to maintain preferred supplier status.1 Although solar P.V. is eligible for large tax credit and depreciation benefits, ProLogis and AMB are both REITs (Real Estate Investment Trusts), which typically do not have large tax appetites at the REIT level. However, REITs can always utilize solar cash grants and in an expanding economy, tax equity investors, including business-motivated electric utilities, can utilize the large tax incentives related to warehouse P.V. installations. Before upgrading to solar P.V. most warehouses need to make investments to reduce energy costs and make roof improvements that are also eligible for substantial tax incentives. 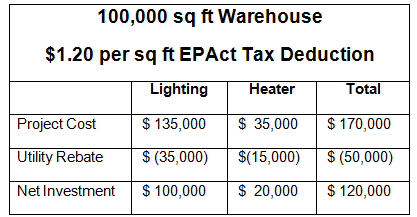 Available Tax Credits for Large Scale Warehouse Solar P.V. 150%-70% of total roof area is typically available for solar panel mounting. A warehouse owner with 100 million square feet of useable roof area has the capacity to generate about 1,000MW of electricity. A small to average sized utility power plant generates about 100 MW, so large scale warehouse owners have the potential to turn their properties into large scale utility providers. In its second initiative scheduled for completion in May of 2011, the company intends to complete a 5 megawatt, $25 million project in New Jersey. This translates to the power generation capacity of a small power plant. Heller-related press releases indicate that the company has used solar P.V. as a competitive weapon to buck "the trend of vacant industrial complexes throughout New Jersey".2 Heller's CEO Jeff Milanik stated "we began this process several years ago with the goal of offering our customers in New Jersey better more efficient space for their businesses. It is a very competitive business that we are in, and we are focusing on ways to improve our buildings". ProLogis has also entered into a similar transaction with Southern California Edison in Fontana, California. The utility has announced that they expect to lease 100 to 125 more rooftop areas totaling 1.5 square miles of roof space during the next five years. It should be noted that the five-year plan correlates to the five remaining years of solar tax credits available from 2012 through 2016. The Fontana project covers almost 600,000 square feet and produces 2 megawatts of electricity. When describing the Fontana project, Julie Schmit of USA today, writes: "The program in which the utility owns the solar is the largest of the kind in the nation, not surprising since California is the number 1 solar market. But utilities in other states, including North Carolina, New Mexico, and Arizona have similar plans to rent roofs for their own mini-solar plants to." ProLogis is also installing energy efficient lighting before the solar P.V. installation. This prior generation T-12 and metal halide lighting is very energy inefficient compared to today's T-8 and T-5 lighting, and a lighting retrofit can easily reduce lighting electricity costs by 40 to 60 percent. In addition to large energy cost reductions from the base building lighting, most warehouses undergoing lighting retrofits install sensors that completely shut off the lighting in portions of the warehouse that are not in use. Previously, many warehouse owners and lighting specifiers were reluctant to install sensors because they reduced fluorescent lamp useful life. Today, improved technology sensors are available with warrantees not to reduce lamp useful life. New and improved commercial heating systems can provide energy cost savings of eight percent or more over the ASHRAE 2001 building code standards. There are multiple heater technologies suitable for the warehouse market, including direct fired gas heaters, unit heaters, and infrared (radiant) heaters . 1 See, Charles Goulding, Jacob Goldman and Christopher Winslow, The EPAct and Alternative Energy Tax Aspects of Wal-Mart's Supplier Sustainability Program, Corp. Bus. Tax’n. Monthly, To Be Published. 2 "Heller Industrial Park Inks More Than 4 Million SF of Leases in 2010." Heller Industrial Parks, Inc.. N.p., 28 NOV 2010. Web. 4 Feb 2011. <http://www.hellerpark.com/pressroom.cfm>.